Configuring background images for toolbars and the file display can appear confusing at first but it's easy once you know what to do. 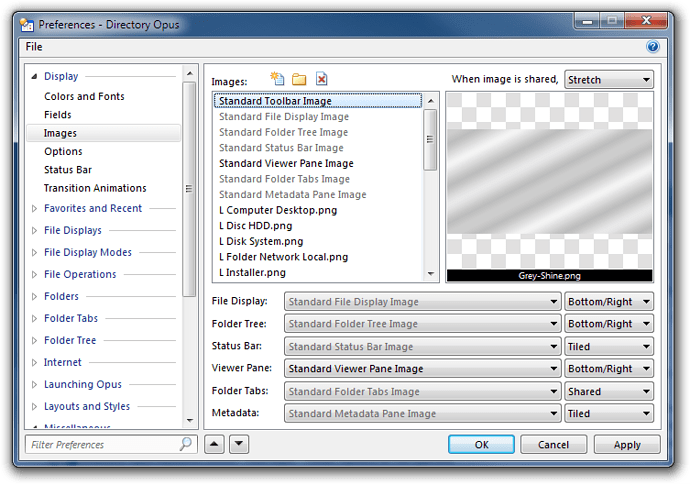 The top section (with the list and preview area) is what defines which images are available to be used throughout the program but it is the bottom section, with the six dropdowns, that actually defines which images get used by default. If you've defined Standard File Display Image at the top, don't forget to select the same thing in the File Display drop-down at the bottom. Toolbar images can be different per toolbar and the setting in Preferences is just a default. Go to Customize mode and check that each of your toolbars has the image you want. Default Formats, Custom is what will be used if nothing else overrides it. Check that first. Check the other formats as applicable. See the separate FAQ on Folder Formats for more information. You can also set images to be shared across several elements. When you do this the Shared drop-down back at the top of the Preferences, Images dialog comes into play. The image will be stretched or tiled to fill the entire Opus window and then the elements, such as toolbars, file display areas, and so on, which are set to use the image in shared mode will have this pattern drawn as their background. This allows a single image to line-up between two adjacent parts of the lister. The effect shown below is made from two different versions of the same image. One version has a blue tint while the other has a green tint. Both are set to be tiled when shared (to avoid their aspect ratio being ruined by stretching). The toolbars and menus are set to use the blue version of the image while the tree, file display and statusbar all use the green version. We're not suggesting that you should actually configure Opus to look like this. This is just a demonstration of how the "shared" setting can be used to create backgrounds which span multiple parts of the window and still line up. Of course, if you want kitten jumping out of your menus then knock yourself out. You can control the amount of blending, if any, that is done between file display background and selection colours and the background image via Preferences, Display, Options.